Our PEAK℠ performance program not only delivers better yields and fewer downtime issues, but also helps customers sustain higher OEE measurements. The PEAK℠ performance program doesn't just incorporate your used packaging equipment and applications into the overall improvement process—it's a packaging equipment training system that works to develop the skills of machine operators and maintenance personnel through customized training programs specific to the customer's equipment, in order to continue operational excellence. At HP Packaging, we've developed PEAK℠ through our years of experience in the field as a leading packaging equipment company. Our PEAK℠ performance program is designed to increase your company's return on investment by reducing downtime, cost overruns, and inefficiencies. By analyzing every aspect of your production line, including personnel, product, and new and used packaging equipment, we work to improve packaging productivity, product quality, asset utilization, and skill of shop floor staff. We will help you solve your most difficult business and technical problems using the talents of our HP Packaging industry experts and our proven approach to reaching optimum performance levels. When a High Performance Packaging client works with us on a PEAK℠ performance program, we are committed to delivering world-class excellence on the shop floor. We focus on the development and implementation of efficient, cost effective, highly operable and maintainable new and used packaging equipment systems. Depending on the size of your operation, the planning and implementation of our PEAK℠ performance program may take only a few weeks or up to a few months. During this time, our technicians and packaging equipment company experts will work with your management team and shop floor personnel to implement and achieve increased productivity, line speeds, efficiencies and reductions in yield losses and labor. 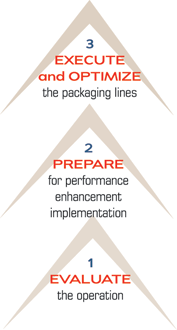 Additionally, a PEAK℠ performance program will include ongoing packaging equipment training and preventative maintenance - continued optimization, evaluation, and implementation.